The Coming War on China is John Pilger's 60th film. 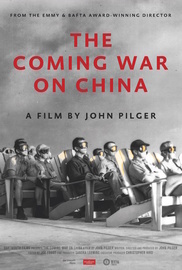 John Pilger's documentary film, The Coming War on China, has attracted huge interest in China, understandably. The original film has been 'pirated' and one version includes Chinese sub-titles. With the world now approaching the edge of possible nuclear war - with threats to North Korea, and China - John Pilger and Dartmouth Films UK have decided to release the Chinese sub-titled version (also English sub-titled) to Chinese viewers, to be downloaded free of charge.